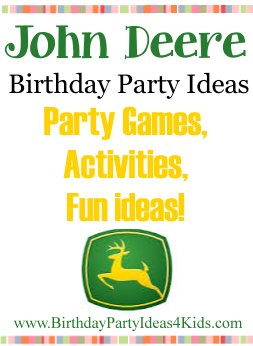 Ideas for John Deere theme invitations, decorations, food, activities, party games, goody bags and party favors. Print out party information on note cards or postcards with the John Deere logo on the front and then wrap in a green bandana. Ask guests to wear the bandana to the party. Cow cards can be made easily by drawing black spots on white note cards or by cutting out black circles from construction paper and pasting to the note cards. The main colors for the John Deere party should be yellow and green with black accents. Cover the party table in a green table cloth and use yellow plates (wheels) with black cutlery. On the table place hay bales or John Deere tractors and tie green, yellow and black helium balloons to them. Or you can place bright yellow sunflowers in mason jars (or glass vases) on the table and tie with a green bandana or ribbon. Place black or green rocks, pebbles or marbles at the bottom of the container that holds the flowers. Take the birthday guests on a hayride. If you don't have access to a trailer you can fill up the back section of a pickup or large wagon with hay. are always fun and a wonderful way for children to experience animals up close. If you have a John Deere tractor or know of someone who does take pictures of the guests in the drivers seat. Print them out before the party ends for them to take home as a favor or include them in the thank you note. Set up a course in your backyard or the park using hay bales and other items such as swing sets, trampolines, slides, hula hoops, etc. Set up a course that goes over, under, around and through the area. You can set up teams to compete against each other or use a stop watch and time each of the party guests. When they have run through it a few times you can change it by having them run through it backwards, on their hands and knees or walking. You need a large container full of hay, Styrofoam peanuts, raffia or shredded newspaper and something for the guests to find - the "needle" - such as small toys, candies or John Deere stickers on yellow paper. We do not recommend using a real needle or anything that is sharp and pointy. Hide the items in the container and let the party guest search for them. Give them a time limit and see how many they can find. Set out small galvanized silver buckets with snack food such as chips, candies or fruit kabobs. In a large bowl, combine the popcorn and chow mien noodles. Place the peanut butter chips in a microwave safe bowl; microwave on 50% power in 30 second increments until melted (stirring every 30 seconds).